Some users have hesitated to adopt wireless printers using WIFI because of security concerns. But with proper protection wireless networks can be just as safe as wired systems. There are several simple ways to protect computers on a wireless network, including installation of firewalls, strong encryption standards such as WIFI Protected Access (WPA), and assigning passwords to folders you want to protect by using Windows share-level access control ("permissions"). Wireless printing devices are offered by several big name suppliers including Brother, Canon, Epson, Lexmark, HP, Samsung, and others. Wireless printing networks are increasingly common in offices, connecting with computers through WIFI or Bluetooth which transmit data using radio signals. WIFI has a range of around 300 feet, while Bluetooth printing works up to about 30 feet. WIFI transmits data more quickly than Bluetooth, but the latter is more common in portable devices such as cell phones and digital cameras. WIFI is readily available in laptops, servers, and printers. It can be very fast, with speeds up to 55 Mbps. 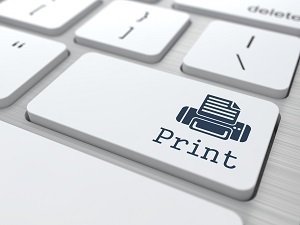 WIFI printing is cost-effective and convenient and offers several advantages. Multiple employees can connect to a single printer from any part of the building, saving your business hundreds of pounds for each network jack you don’t install. They also offer improved flexibility, as you can print from anywhere within range of the wireless network so you don’t need to be tied to your desk. And lastly, they make for a neater work space: going wireless means no more messy cables cluttering the floor.